I'm not an expert photographer and I really don't own a fancy SLR camera but knowing that Canon's got the world's first waterproof SLR lens gets me all excited about buying my first DSLR camera. I heard it can withstand temperatures as hot as your coffee. Check the break for this exciting gadget. Too good to be true? Well yeah it is. 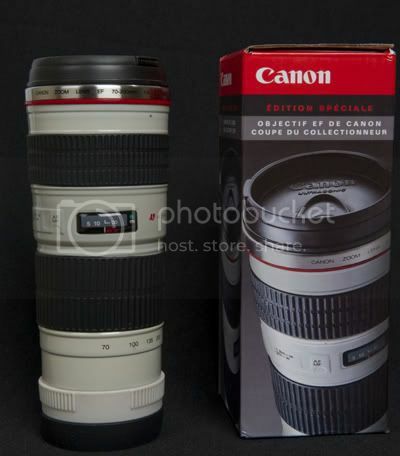 It's a coffee travel mug designed to look like a 70-200mm Canon L-series "white" lens. Apparently they were giving it out to attendees of Canon's Olympic Press Center in Vancouver. This will make a really nice gift to any photography enthusiast, assuming they make it publicly available. Just a thought.. Would anyone really dive in water as hot as coffee AND take pictures? Of what?